Chicken wings are like oxygen at our house – especially these buffalo ranch chicken wings. 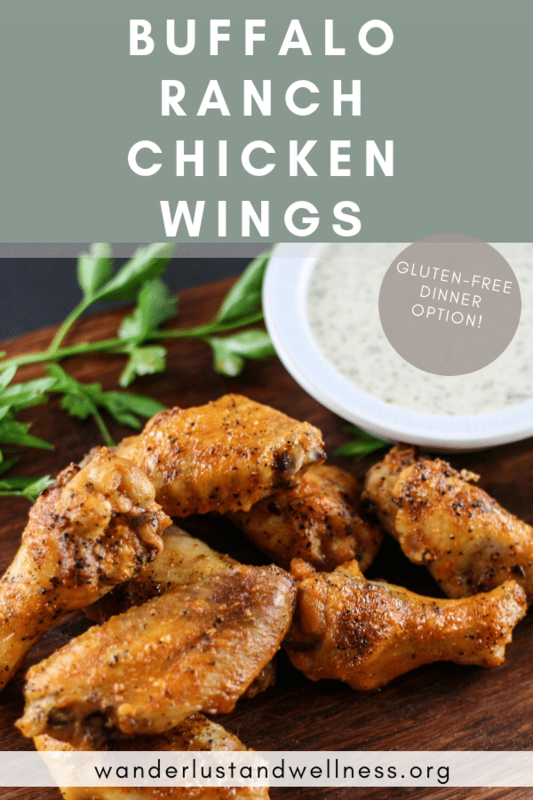 Chicken wing recipes are so versatile, so many different flavor combinations; you can never go wrong – but this is one of our favorites. One would think I intravenously pumped buffalo sauce into my kids when they were infants, but really, I didn’t, they just LOVE chicken wings! In my early days of dating my husband he took me to a local bar for wings, it was love at first site. Instead of the phrase “you had me at hello”, it should read “you had me at let’s go for some wings”. These buffalo ranch chicken wings are baked, and the key with these wings is to bake them, then dip them in the sauce, then put them under the broiler for about a minute. This cooks the sauce on just enough into somewhat of a ‘charred’ state and then you won’t have slimy wings to wrangle with. 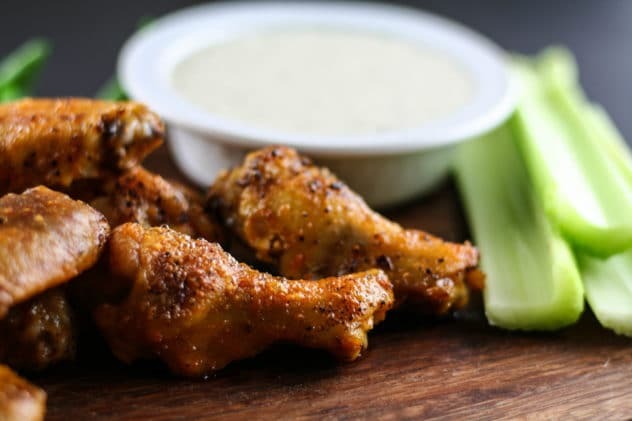 How to make ranch wings? The key to making delicious ranch wings is to add the ranch dressing to the hot sauce before coating the wings. 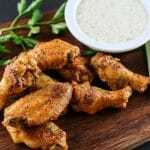 You’ll actually add ranch dressing to the hot sauce, heat, then dip the cooked chicken wings in the ranch wing sauce. 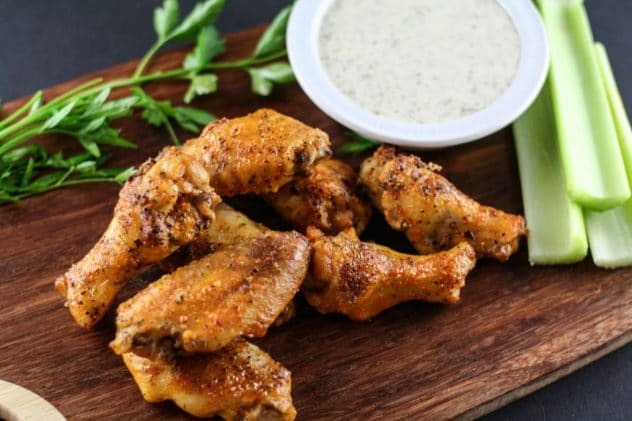 How to make ranch wings in the oven? Oven baked wings can still be just as crispy and delicious as pan-fried wings. You’ll want to use a broiler pan or place a cooling rack onto a foil-lined baking sheet – something that lifts the wings off of the pan while they cook to allow for the heat to reach all sides of the wings. First, season the raw wings with sea salt and cracked black pepper. Then, bake the wings for 35-40 minutes or until the wings are fully cooked and remove from the oven. While the wings are cooking I make the buffalo ranch sauce. This sauce is a mixture of buffalo sauce and ranch dressing. I was introduced to this sauce by my husband and I pretty much won’t eat any wing sauce BUT this sauce! I use my dairy-free Paleo ranch dressing recipe and mix it in with grass-fed butter and buffalo sauce. Once the wings are done I dip the wings into the sauce and place back onto the baking sheet. Then I place them into the oven under the broiler for about 1 minute, not very long because you don’t want them to burn. This process allows the sauce to cook onto the wing but still leaves enough sauce to enjoy. Additional buffalo inspired chicken recipes you may like! Place wings onto broiler sheet and coat with salt and pepper mixture. (If you don’t have a broiler pan you can line a baking sheet with aluminum foil and place a wire rack onto the sheet). Bake for 35-40 minutes or until the wings are fully cooked. While the wings are cooking, combine the buffalo sauce, ranch dressing, and butter into saucepan and heat on medium-low, stirring occasionally. Once the wings are done cooking, remove from oven and dip each wing individually into the sauce, then place the wings back onto the broiler sheet. Turn the oven to broiler and place the wings under the broiler for about 1 minute, watching closely. You want the sauce to cook onto the wing but not burn. Serve with ranch, veggies, or any other dressing you’d like! Oh man this is HAPPENING! Pinned. I’m a big happy fan of buffalo ranch, also- in addition to it being a superb condiment, I use it as the sauce when I make buffalo chicken pizza. Yes! I am a buffalo addict! Finally! Hot wings with the ranch dressing built right in! These look seriously delicious! Once I converted to ranch combined with buffalo I never turned back!